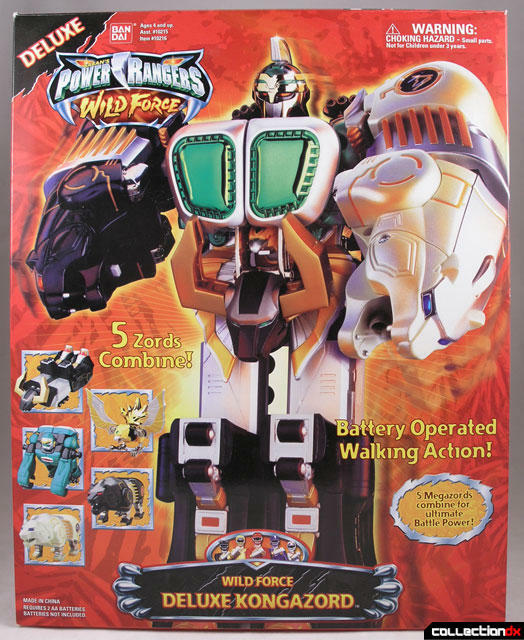 The Deluxe Wild Force Kongazord is the US equivalent of the DX Hyakujuu Gattai Gao Muscle from Hyakujuu Sentai GaoRanger. They all combine to form the mighty Wild Force Kongazord. The Gorilla forms the central body and head of the Kongazord. It retains the metal from the Japanese version but lacks paint detail. 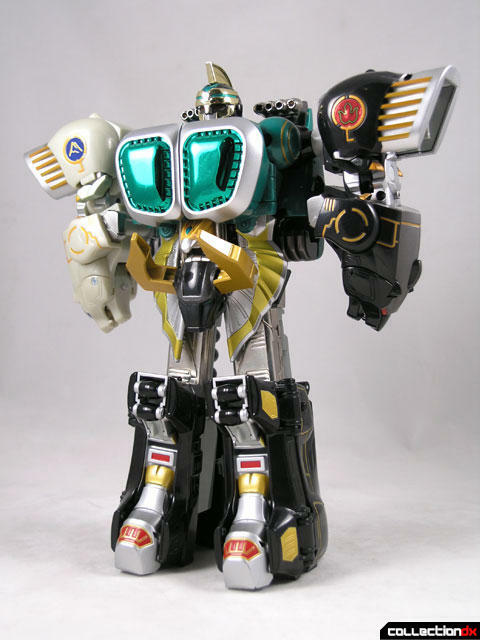 The Polar Bear and Black bear become the arms of the Kongazord. They both feature a missile firing action. One major difference between the US and Japanese version is that the US version had the chrome legs replaced with silver plastic. The Eagle becomes the waist area, and seems identical to the Japanese version. The biggest change comes with the Bison. 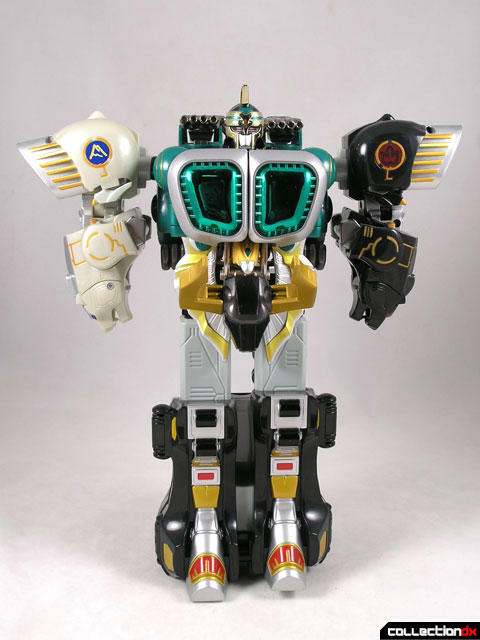 Bandai America, in their infinite wisdom, thought the Kongazord needed more “Play Value”. They created an all new mechanical Bison that has a battery powered walking feature. The bison is larger than the original, and uses a completely new large head sculpt. This bison can also transform into flatbed mode. 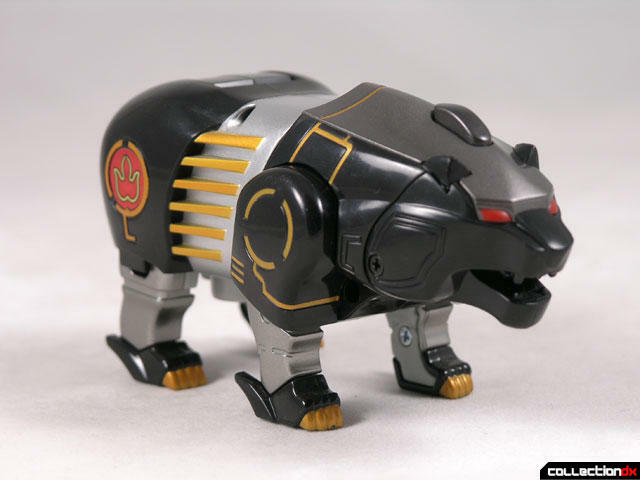 If you don’t like the look of this new plastic bison, you can easily swap legs with the Deluxe Wild Force Megazord. One more notable omission in the US version is the lack of the anchor chain weapon. Normally it is stashed in the chest compartment, but my guess is it was omitted due to safety concerns. Although not as good as the Gao Muscle, it’s an OK replacement that does most of what the original did. I’m sure kids had fun with it - it’s a fine toy on its own merit. Are you SURE the American release omitted the Anchor weapon? 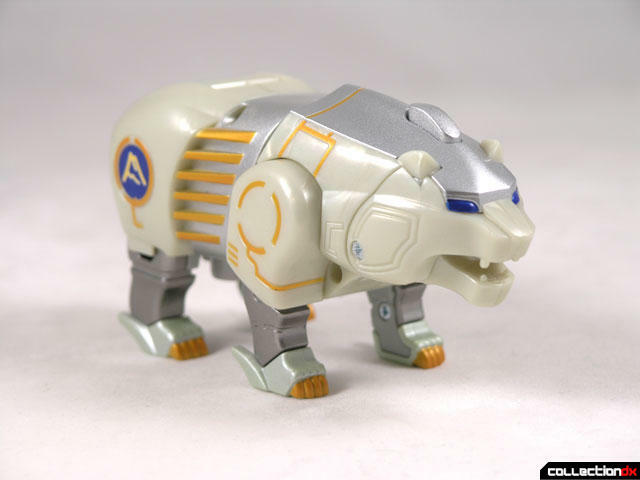 Because I've got a Gorilla Zord, allegedly from the American release, and it DOES have the anchor! Did you get your Green Gorilla second-hand...? 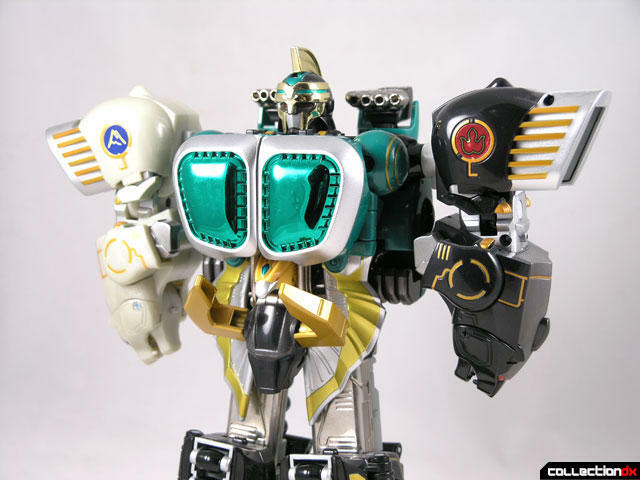 Well, the thing is, BoA stopped bringing over the metal chains after the first season of "MMPR" in the motorized Deluxe Titanus The Carrier Zord set. 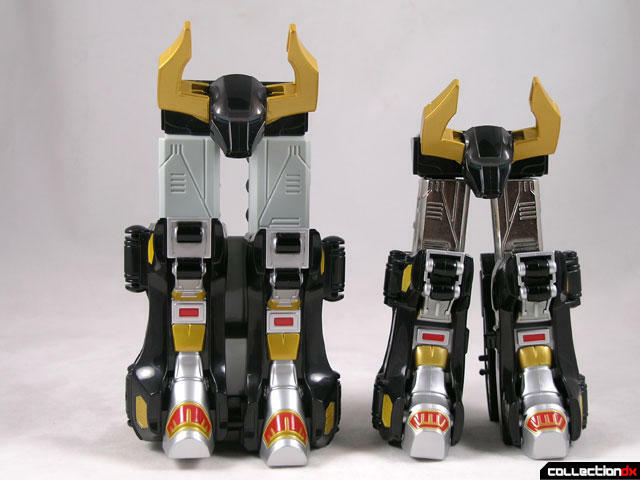 The next time chains appeared in the series was for Zeo Zords-1 and -2 in the Deluxe Zeo Megazord (which- I know- I still have to review), but BoA replaced them with gold-colored strings. All future chains were replaced with cords of equivalent color as well. 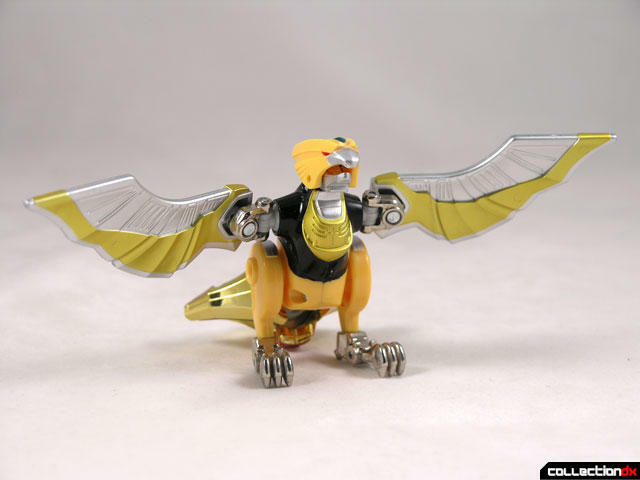 Through my research for the PA-4 Gao Gorilla, I found that the Kongazord- which was the only way for US collectors to obtain the Green Gorilla Wild Zord- did not include the Muscle Anchor weapon- most likely because the plastic part was rather small, and it had that metal chain attached to it. The other thing to consider is that the Dlx. Kongazord set had that motorized walking feature, so including the anchor weapon (and the ice/fire missiles for the bears, too) could have pushed the price up too high to be marketable [or safe by US toy standards].